Valve showed off a new, slicker controller for its HTC-backed Vive virtual reality system at the Steam Dev Days conference today in Seattle. While the event is not open to press, developers in attendance tweeted photos of the device from a slide presentation. The main new feature appears to be the ability to open your hand while holding one, without dropping the controller. If that action is tracked by the controller, that would help VR developers better replicate natural hand movements in the many, many VR games that render Vive controllers as virtual hands. Attendees say that a prototype of the controller is available at Steam Dev Days. It’s unclear when it’ll be out, what it’ll cost and whether people who have the current Vive controllers will get any sort of deal if they want to upgrade. We’re checking with Valve about that. 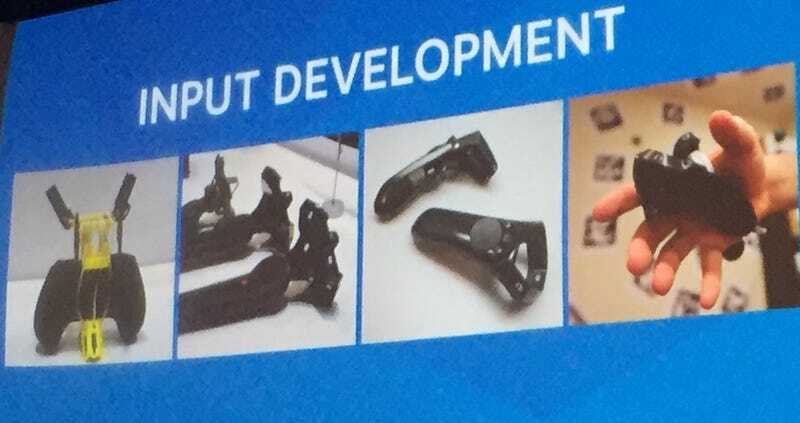 The original Vive controllers, which cost $130 apiece and are usually used in pairs, looks like this. They already works pretty well for mapping different hand grips in VR, thanks to buttons on the top, back and sides of the controller. The Vive came out this spring. On the one hand, it’s nice to see technological improvements. On the other, a new controller this soon? Bold move.